Codec Tweak Tool is a free portable program for Microsoft Windows devices designed to troubleshoot and correct media playback issues on Windows. The Windows operating system ships with support for a limited number of media types. Windows Media Player and other multimedia players on the system can play these supported media files, but not any other file. Users of the operating system have two options then when it comes to playback of unsupported media files. They can either install codecs and filters to add support for missing media file types, or install a third-party player that ships with its own set of binary codecs so that global codec installation is not required. 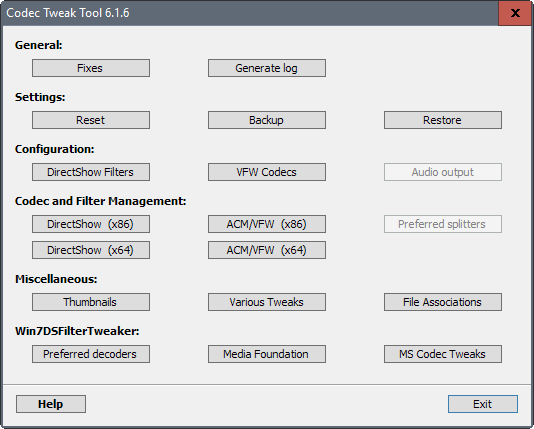 Codec Tweak Tool is a troubleshooting tool for Windows users who have installed codecs and filters on the system. While it is usually better to install codecs and filters individually, at least some users install codec packs on the system instead that add many to the system in one go. This is more convenient for the user, as things work fine usually after installing the code pack. It does add overhead to the system though, and may also introduce issues when it comes to playback, especially when multiple codecs are installed that support the same media type. Codec Tweak Tool may be used to fix these issues. The portable program can be run from any location without installation. It displays a set of buttons on start that you can click on to use the functionality. The first button, fixes, scans the Registry for issues. 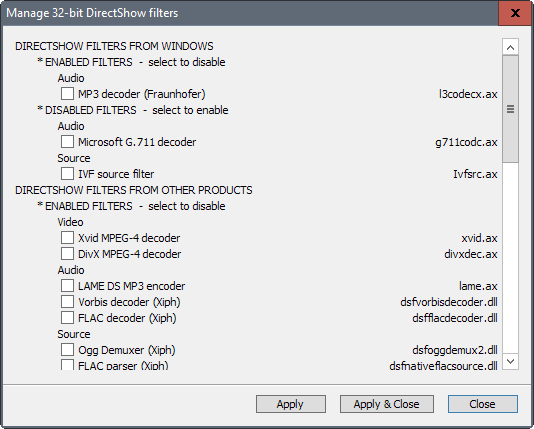 It has been designed to detect and remove broken codec and filter references, and may also be used to clear various Windows caches and register Directshow filters again. The tool displays issues that it has found during the scan in prompts. 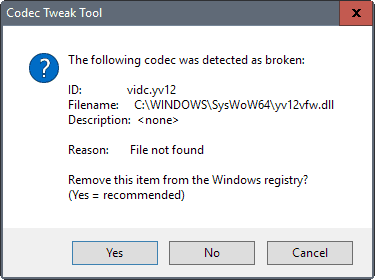 It is up to you to accept the suggestion of Codec Tweak Tool -- which usually is removal of the item from Windows Registry -- or keep the broken setting. This procedure alone may fix media issues on a Windows machine. But there is more. Another useful feature of Codec Tweak Tool is that you can use it to manage any codec or filter on the Windows machine. A click on the four manage buttons enables you to disable codecs and filters on the machine. This can be useful if multiple codecs are installed that support the same media types. Disabling all but enforces use of that particular codec for the media type. Codec Tweak Tool may also be used to disable Microsoft codecs and Media Foundation for select media types. The developers have built-in an option to manage preferred decoders on top of all that. This works similarly to preferred Filter tweaker for Windows which we reviewed in the past. You may also use it to generate an extensive log file listing installed codecs and Directshow filters, and reset settings. Codec Tweak Tool is a handy troubleshooting tool for Windows. While it is not super useful if third-party players with binary codecs are used, it can be mighty useful to fix issues caused by the installation of codec packs or individual codecs. Now You: What's your preferred media player on Windows, and why? It makes more sense to install a media player that bundles or compiles FFMPEG such as Media Player HomeCinema and others. Codec management is an endless black hole no matter how good the tools are. PotPlayer for the win. Plays anything, low resource usage and great custom skins available. I use VLC. Almost never have codec issues. I wish they made potplayer 64 for linux. Or just use any decent player with ffmpeg/libav backend, like mpv or vlc and never have any problems at all. Codec issues and unsupported media types are a thing of the past. As others have mentioned modern players take care of this issue. I cannot remember the last time I ran into such a problem.